Janet’s Kitchen is tucked into the side of the International Plaza Market, and is run by Janet and her business partner Hishim (who previously cooked at the Happy Greek before starting this venture last year). 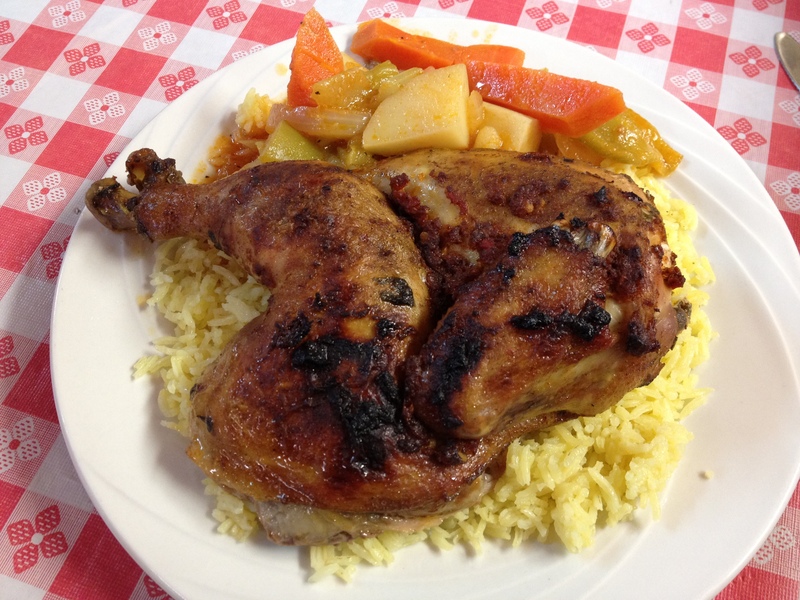 The duo hail from Syria and Egypt, and offer a variety of Middle Eastern dishes ranging from standards such as shwarma and gyro to roast chicken and lamb shank. 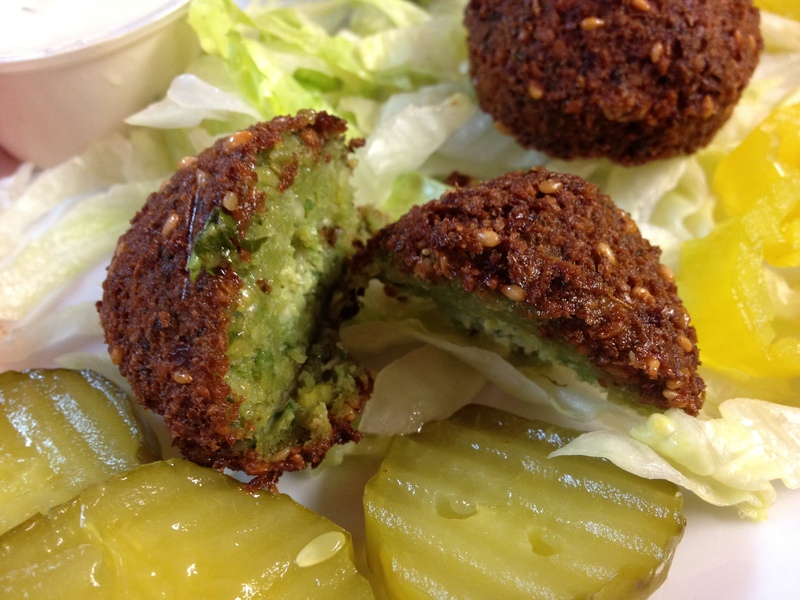 Falafel are freshly made to order and were among the best we’ve tried in town. We were particularly taken by the kefta kebab which was notably juicy and flavorful. 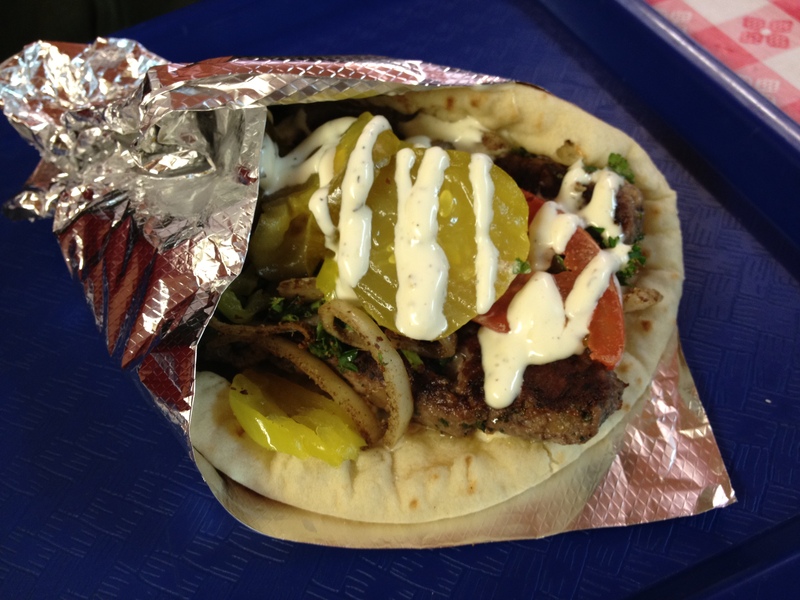 It can be ordered with rice and vegetables or as a pita sandwich. As both the lamb shank and chicken are extremely tender, Janet tutted at us when we asked for a knife, finally handing us one even though she swore that we would not need it. She was right. Lamb, chicken and other daily specials (fish fillet or meatballs are two examples we have seen) come with a mountain of rice and sauteed vegetables. It makes for a hearty meal as well as a good value. The rice was exceptionally good and unique – we were very curious as to how it was made but Janet wasn’t giving away any secrets. We’re guessing butter had something to do with it. 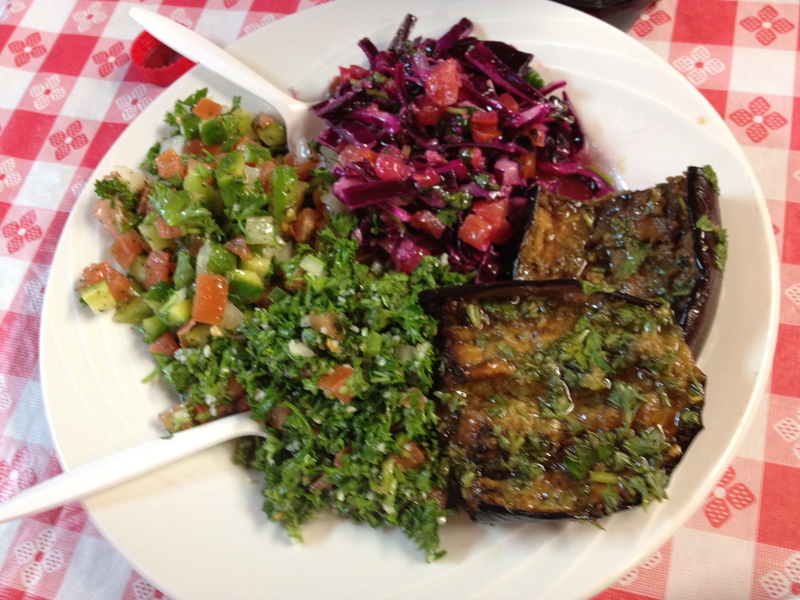 There are also a variety of salads and cold dishes pictured below: tabbouleh, salad shirazi (cucumber and tomato), red cabbage salad and roasted eggplant. Most notable was the garlicky, tart, roasted eggplant. Janet’s Kitchen has two or three tables set up to dine in but is primarily set up for take out. The market has a butcher’s counter at the back of the store and a bulk dried goods section as well as a decent range of Middle Eastern packaged goods. Colonel Gaddafi may be dead, but his favorite breakfast lives on! 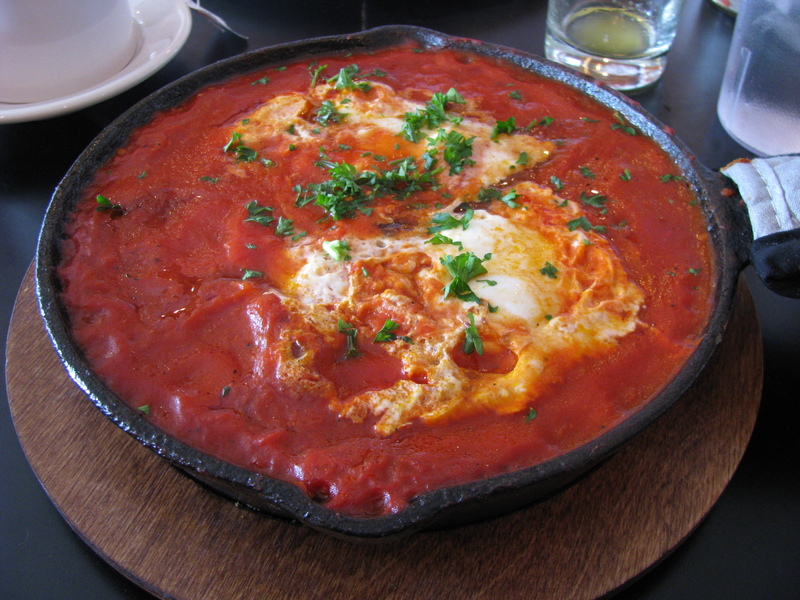 According to The Olive Tree’s owner David Mor, Gaddafi was a fan of shakshuka – a Middle Eastern dish that is also popular in David’s country of birth, Israel. Shakshuka has become one of my favorite brunch items. A thick stew of tomatoes, onions and peppers in which two eggs are poached. The dish is served in a cast iron skillet (be careful you don’t burn the roof of your mouth) and can be spiced up with merguez sausage, feta cheese, or today’s special – eggplant. Each pan of shakshuka is served with a pile of pita triangles to dip into the stew and (my favorite part) the runny egg yolk. The brunch offerings at The Olive Tree (served 10am-2pm) on Sundays run the gamut of the Jewish diaspora, ranging from bagels and lox to Challah french toast and jachnun – a traditional Yemenite Jewish breakfast dish, cooked slowly overnight so that one does not have to cook on the sabbath. 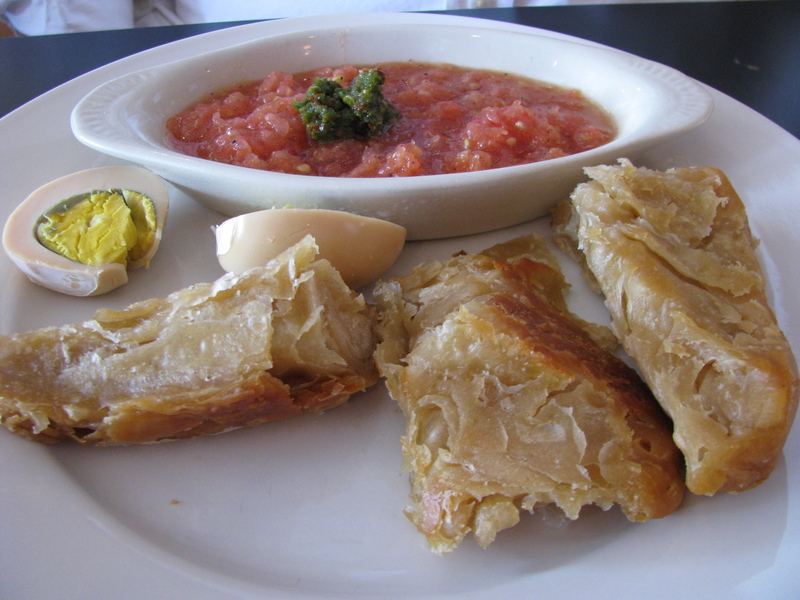 Jachnun is a crunchy pastry dish that is served with a hard boiled egg, fresh grated tomato and a hot sauce called s’chug. It’s hard to resist adding an order (or two) or the burekas. A crispy, cheesy puff pastry dish that’s always perfectly golden brown. David and his wife Tammy are always at the restaurant and are extremely friendly. David loves to interact with guests and is willing to share his fascinating life story. He was formerly an exercise physiologist and soccer coach before fulfilling a dream of owning his a restaurant. 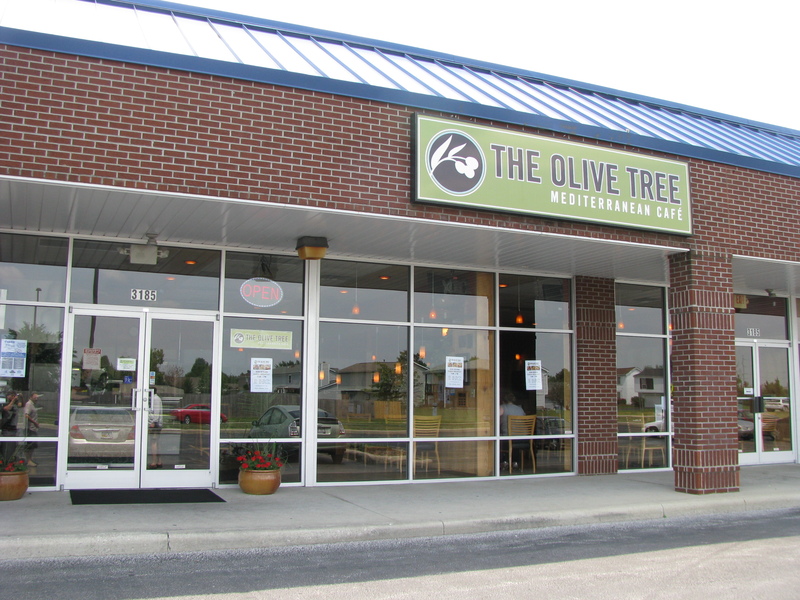 The Olive Tree has a broad lunch and dinner menu that represents many different Mediterranean countries as well as a few American staples. It’s definitely a something-for-everyone kind of a place. 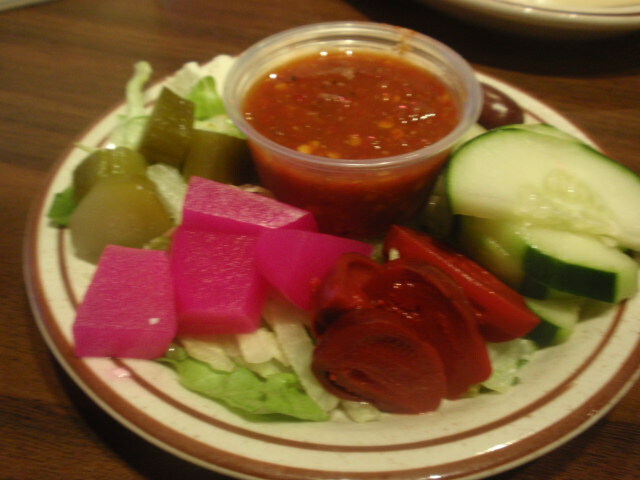 There are a number of dishes that are less commonly found in Columbus. Two of my favorites are the two dips machmusa and matbucha. Machmusa is made from sauteed eggplants which are slow cooked with tomato and onion. Matbucha is a tomato based Moroccan dip slow cooked with roasted red and jalapeno peppers, garlic and olive oil. We also enjoyed The Olive Tree’s rendition of baba ganouj . Nazareth Restaurant and Deli is an icon of alt eats in Columbus. It opened over twenty years ago in the Columbus Square Shopping Center at SR 161 and Cleveland Ave. This is an area called the United Nations of Columbus food by a few. 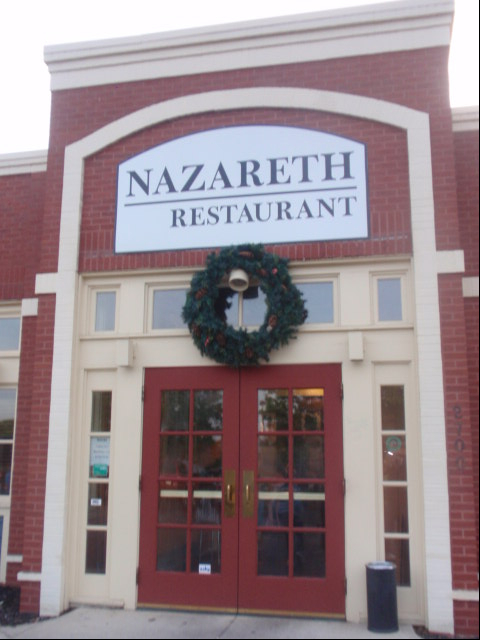 Nazareth was a pioneer in the non-campus, non-chinese cuisine of northern Columbus. The restaurant quickly became a local favorite due to good food at a good price as well as the engaging personality of owner Hany Baransi. He is quite a character – the restaurant web page lists one of his signature quotes “I love you man” and warns diners that Nazareth is not responsible for food addictions. The phrase Ahlan Wa Sah Lan (welcome in Arabic) greets diners in the parking lot and inside at the entrance. 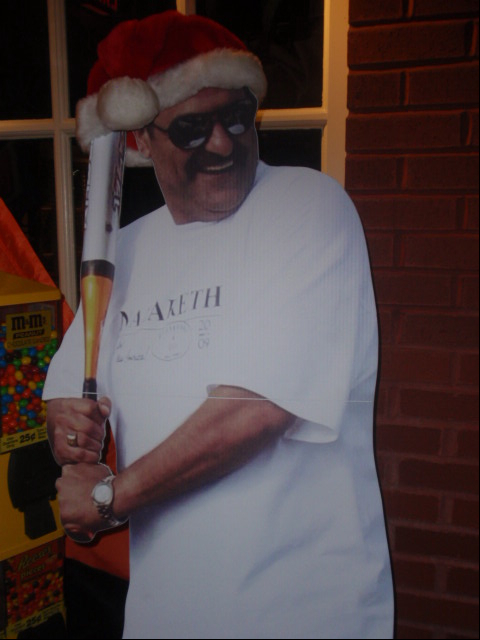 Visitors are welcomed by the image of Hany wielding a baseball bat in a Santa hat. The baseball bat is his trademark. He can be seen toting it with him in the aisles. I am not sure about the back story on that bat….and I am reluctant to ask. Hany hails from Israel so I am sure he tough when the occasion calls for it. The restaurant has been successful over the years. In 2010 Nazareth moved into a former Chili’s restaurant about one-quarter mile from its original location. The move greatly expanded the dining area and added a bar to the mix. On my visit, the bar was packed and a one man band singing 1970’s era cover songs echoed throughout the restaurant. That site did so well that have now moved to yet another sit on Hamilton Road. 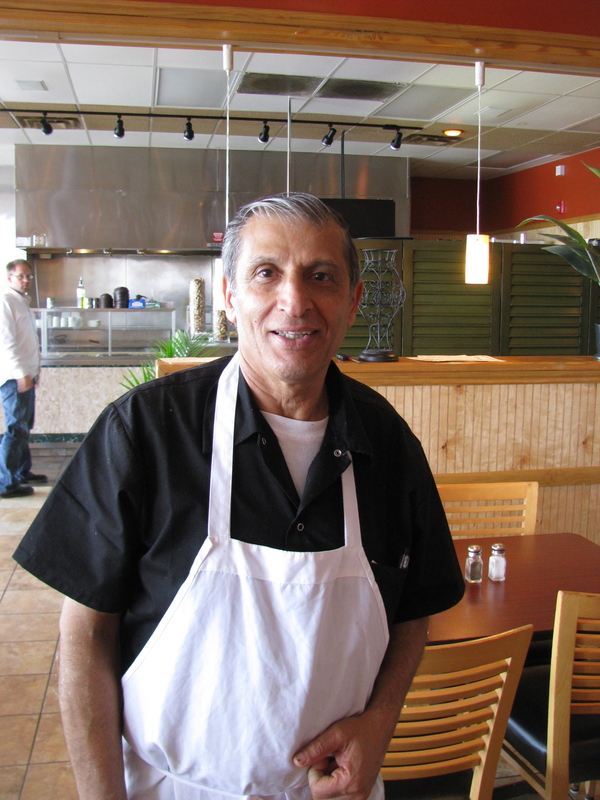 Nazareth is still a family operation with family members mixed among employees in the kitchen and waiting tables too. 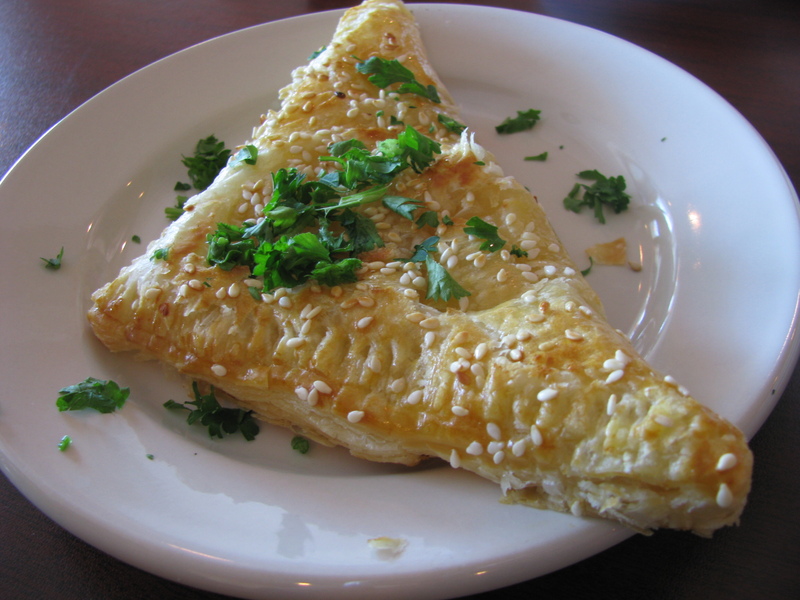 The menu is classic Middle Eastern offering all of the staples of this type of cuisine. There are some unexpected items for diversity sake including Freedom Fries, a grilled bologna sandwich, Rachel’s gyro with American cheese, a Catfish gyro and beer-battered onion rings. The above are all well executed comfort food. Hany’s daughter explained that when families come in, some of the older and younger people are not sure what to do with Middle Eastern fare so Hany wants everyone to have something that can be enjoyed. He might tempt reluctant diners to try some hoummus then led them slowly into culinary diversity. The Middle Eastern entrees are all well done with several being my best-loved versions / interpretations in the city. 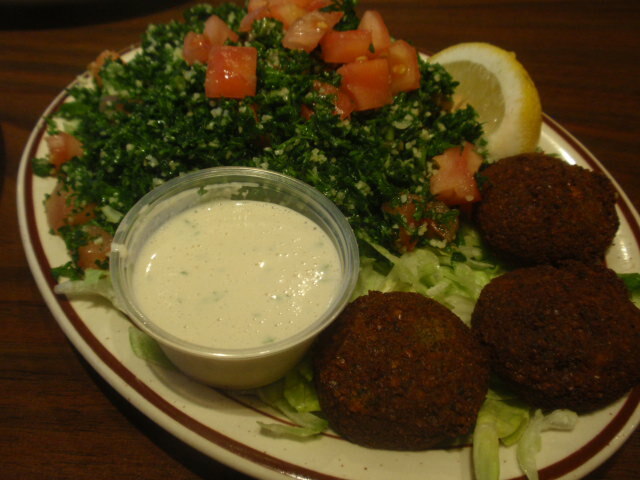 One of my favorites is the Vegetarian Mediterranean Dinner which includes – hoummus, baba ghannoug, falafel and tabbouli salad served with pita bread. The pita bread is served warm which is a small but much appreciated difference. All other baba’s I have had pale in comparison to this one. Somehow it is a little less bitter, a bit more balanced and maybe has a little more love it in. I can’t fully explain the je ne sais quoi of this dish. On this subject my dining companion said “it made whatever my mother used to do with eggplant a crime that should be punishable by jail time or hard labor.” That being said let’s move along to more of the menu. 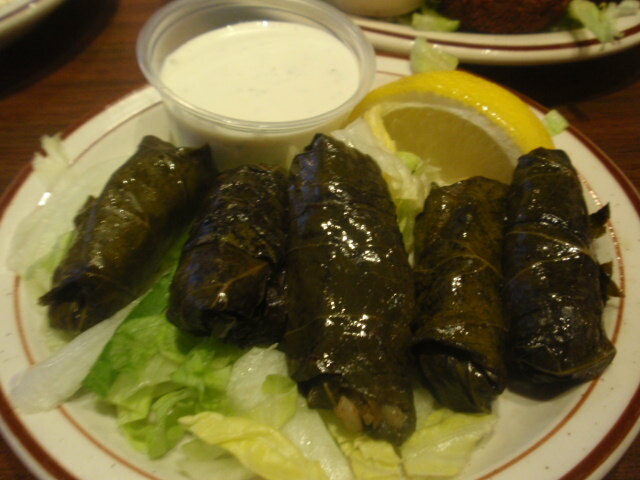 There are two versions of grape leaves. One is vegetarian and the other is stuffed with ground meat as well as rice, mint and a mix of spices. Both are excellent. While these grape leaves are smaller versions than encountered most places they pack a big, flavorful punch. Lentils and Rice is another signature dish. The main ingredients are mixed with caramelized onions, seasoned with cumin and other spices. Nazareth’s House Sauce is served on the side (I have not figured out all of the substances in the sauce yet but the sum of the parts is very good). The menu includes several other dishes, good soups and salads as well as desserts. My favorite item is the smallest and most simple. A sampler dish of pickled baby eggplant, pickled turnips, pickles, cucumbers, olives and Feta cheese is served with some entrees. I could eat this sampler all night with some warm pita bread and ignore anything else in front of me. I invite you to visit Hany and his bat some day soon to pay tribute to Columbus “alt eats” history. 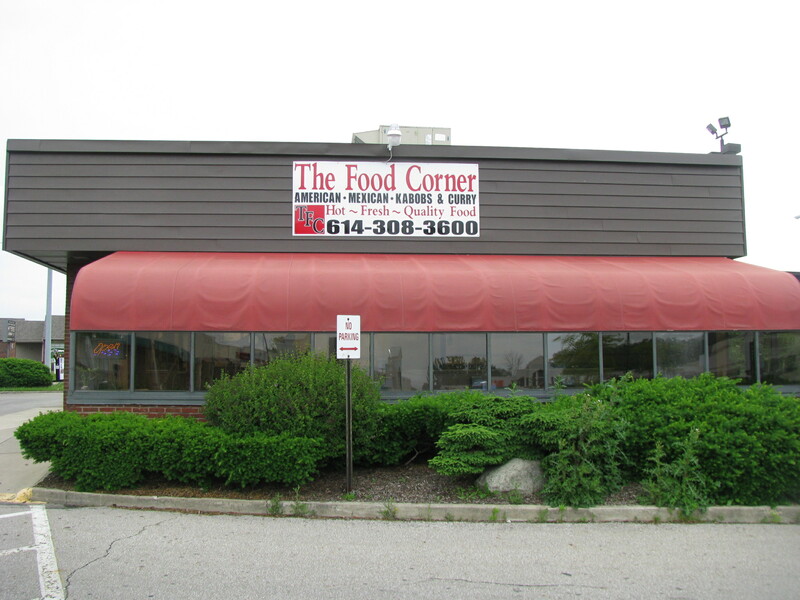 Note: As of 10/9/2010, The Food Corner is closed. Anyone remember the Kentucky Taco Hut that used to be in the OSU campus area? I think we found its indie cousin. Much as you could leave KTH with a bucket of original crispy, a meat lovers pie, and a burrito supreme or two, at The Food Corner you can take your pick from a menu with such divergent items as quesadillas, fried bologna sandwiches, gyros and tandoori chicken. We’d driven by The Food Corner on numerous occasions, and while we’ve gotten a chuckle out of the ‘American – Mexican – Kabobs & Curry’ sign, we can’t say it inspired us to try them. It took an Indian gentleman’s suggestion (we bumped into him during a fruitless attempt at finding a rumored Filipino grocery on the west side) to nudge us into entering. It’s clear this used to be a fast food restaurant – perhaps a Wendy’s? At any rate, for such a conversion, it’s unusually clean and well sorted out, if maybe just a bit lacking in the charm department. The process seems to be that you order at the counter, sit (your meal will be brought to you) and then return to the counter to pay. The menu (above) that shows the aforementioned motley mix o food is surprisingly extensive and almost comically wide-ranging, but it really just scratches the surface. There is also an entirely separate full Indian menu – with, I kid you not, 102 additional items – as well as an Indian lunch buffet. I don’t think we’ve ever seen a more ambitious range of items on offer anywhere. Since the owners appeared to be of Indian origin and the recommendation came from an Indian man, we stuck to the Indian menu. 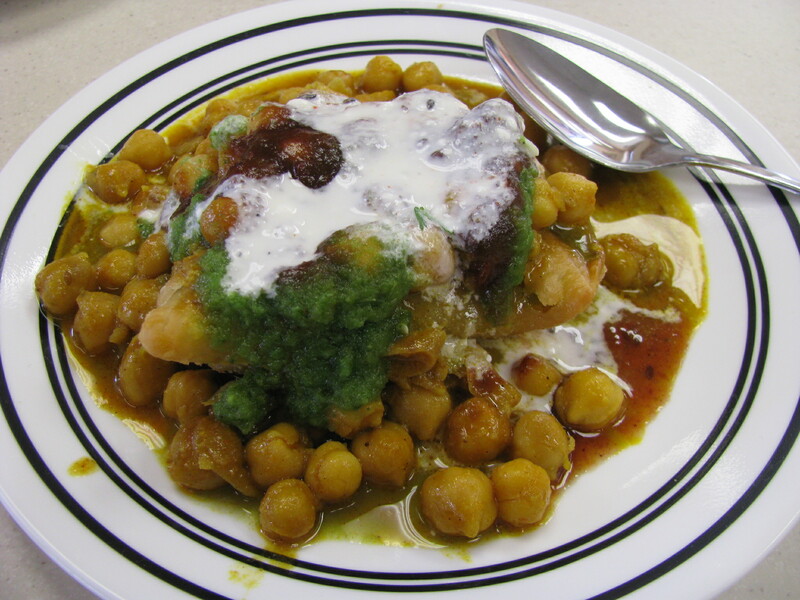 First up was the vegetable samosa, served chaat style – with chickpeas and a variety of sauces. There were a lot of flavors playing well together in this dish, but the samosa itself struck us as being a bit on the chewy side. 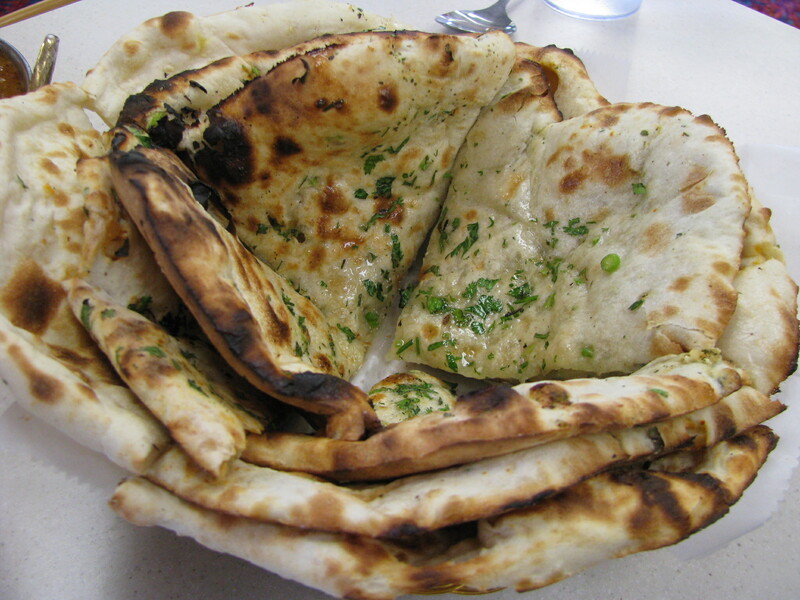 Next came the ‘bread basket’ – a mix of naan, garlic naan, and aloo naan. All of these were enjoyable – particularly the aloo naan with its potato and onion filling – but they’re not quite up to the heavenly deliciousness of Mecca’s wonderful bread offering. We have no idea what came out next. We ordered an item off of a photo on the wall that is not on the take home menu we intended to rely on… and what came out most assuredly was not that item anyhow. It was a chicken dish in a brown sauce, and was surprisingly bland by the standards of Indian cuisine. The chicken was on the dry side. 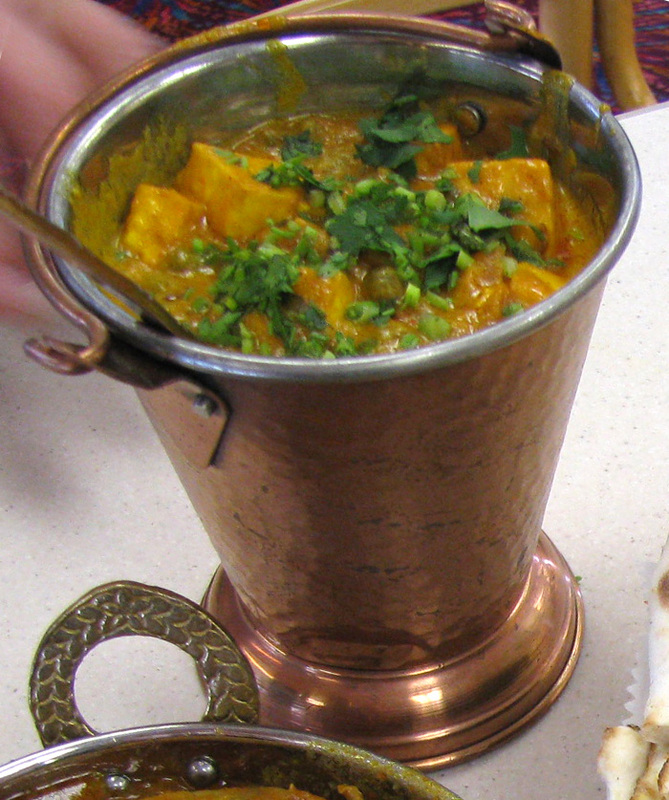 Last, but not least, was the mattar paneer… which, mercifully, was both as-ordered and on the menu. The paneer – a light, rennet-free cheese – was as good as any I’ve ever had, and the sauce that came with it was enjoyable if curiously subdued. 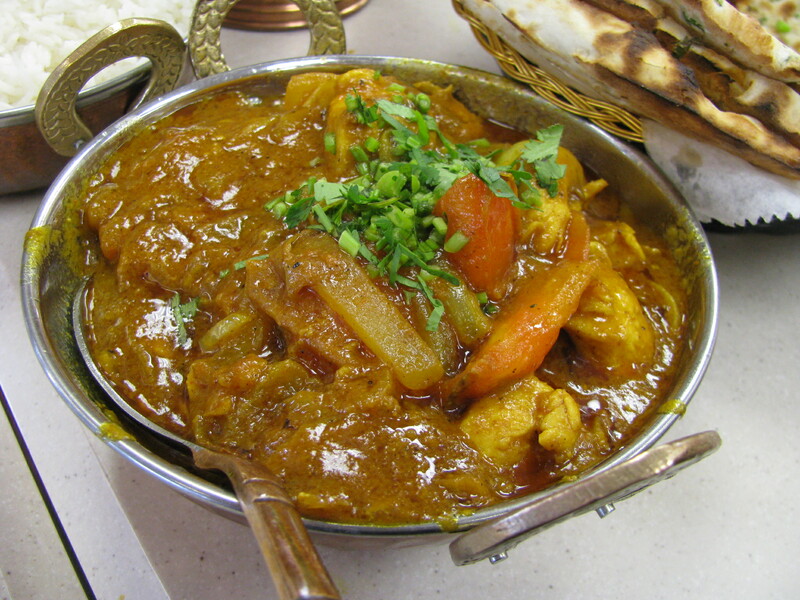 This is but one of twenty vegetarian options available on the Indian menu. The buffet (which went untried on this visit) seemed a good value at $6.99. 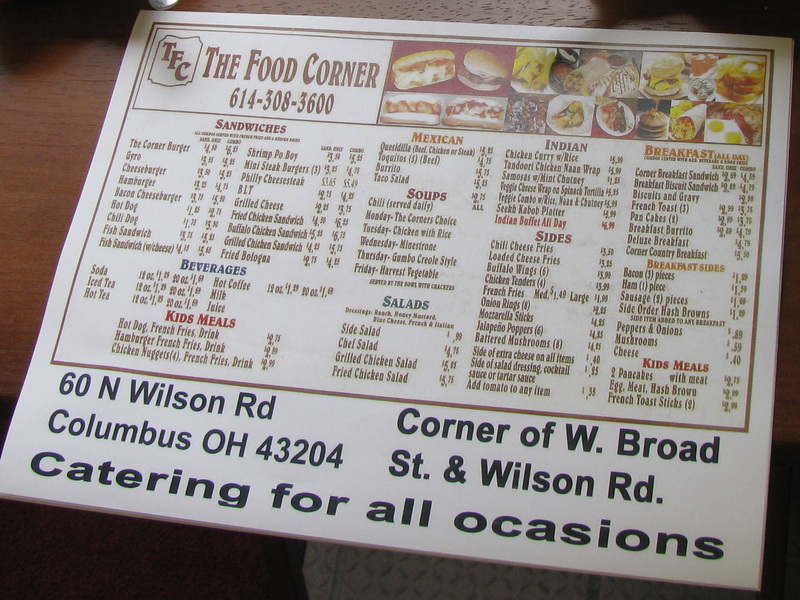 The Food Corner’s service was solid, and the owners were thoroughly kind and helpful. Our recap of our experience isn’t entirely glowing, but it’s hard to suggest that that should mean anything when there was (due to the size of the menu) so much left untried. To that end, if any of our readers do try (or have tried) the place, we’d love to hear from you in the comments. 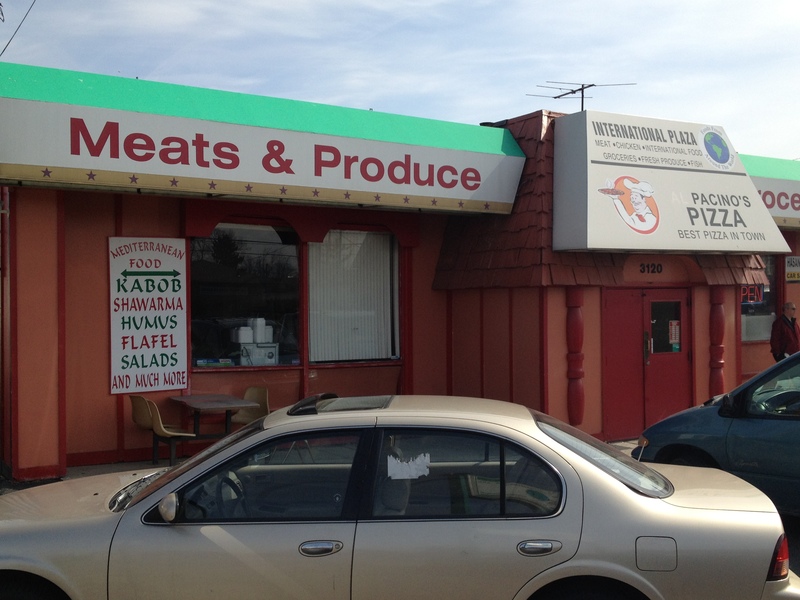 There are lots of ethnic markets in Columbus that offer far more than you might guess from first glance: Arirang, Mecca and Salam, just to name a few. 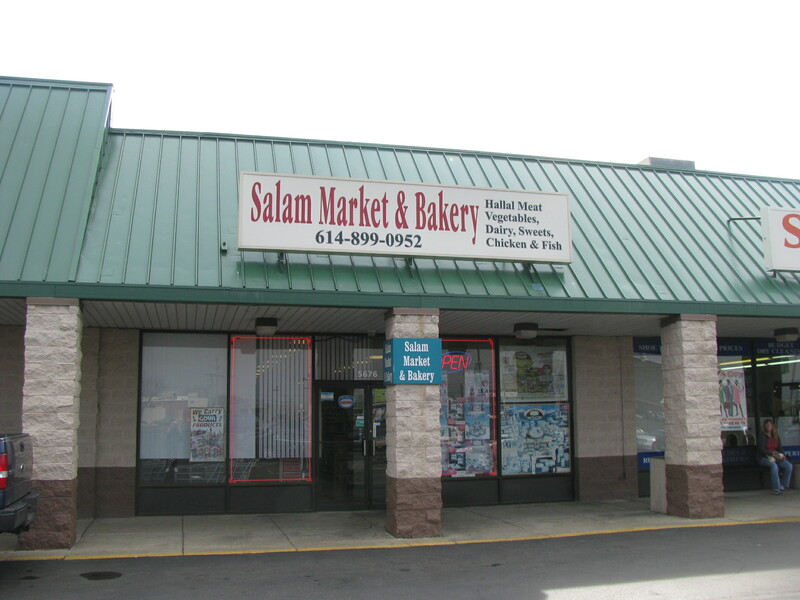 Salam is a wonderfully organized, clean grocery store where you can stock up on dates, olives and spices, but it is also a halal butcher (and the first place I have seen lamb tongues) and a bakery. 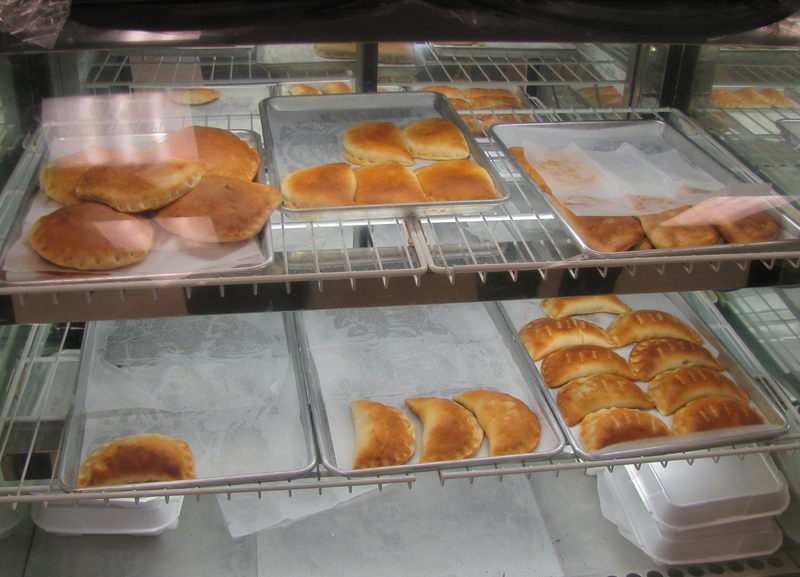 We had heard rumors about the meat pies at Salam and were determined to try them. Our first attempt was unsuccessful and we learned the hard way that they sell out by lunchtime. Our perseverance paid off: These pies are seriously good. Our early start was rewarded with a choice of six pies (three vegetarian and three meat): cheese, chicken, spicy kebab meat, zatar, falafel and a larger chicken pie. The regular pies were $1.50 each and the larger chicken pie was $1.99. The pies, which of course reminded me of Cornish pasties. 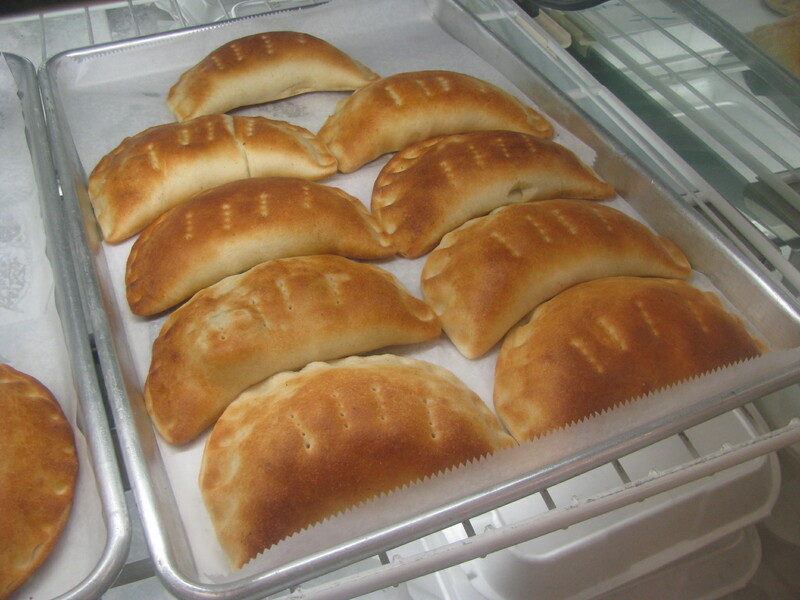 were made from pita dough made fresh that morning. We chose the cheese, chicken and kebab options, all still warm from the oven. The gooey cheese (possibly halloumi – we didn’t ask) was buttery and salty and fairly mild flavor-wise. It would be good with some chutney or hot sauce. The chicken and the kebab were chunky tomato and onion based sauces with meat. The kebab (of the ground and seasoned meat variety) had some chili heat and the chicken was milder but fragrant with cardamom. The bread was light and soft and it wasn’t hard to see why these sell out quickly. The open kitchen means that you can watch them making pita bread (they supply restaurants such as Jeddo Kebab and Lavash). 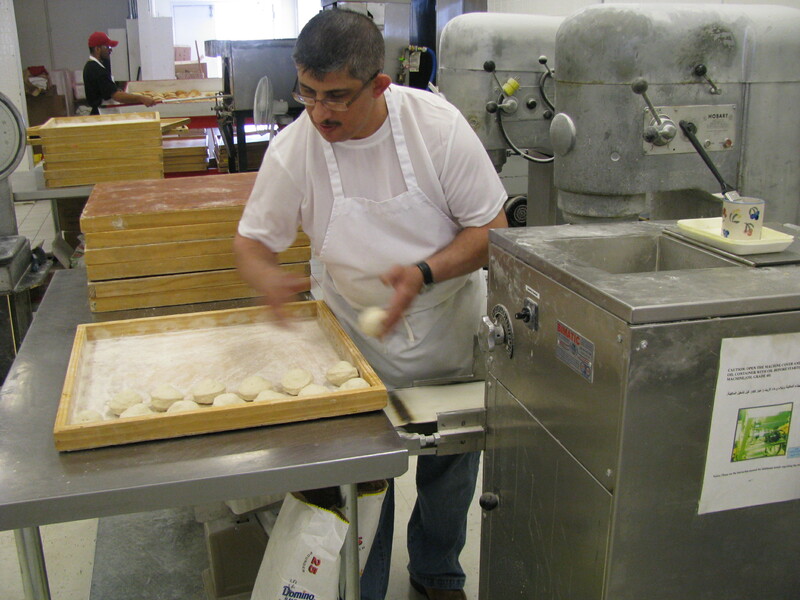 The dough is mixed and kneaded, divided into balls, rolled into rounds and left to rise before it is baked. The guy in the red cap is taking hot pita breads out of the oven. The pies were not labelled but the staff were friendly and happy to explain the fillings and prices, and let us watch what they were doing. 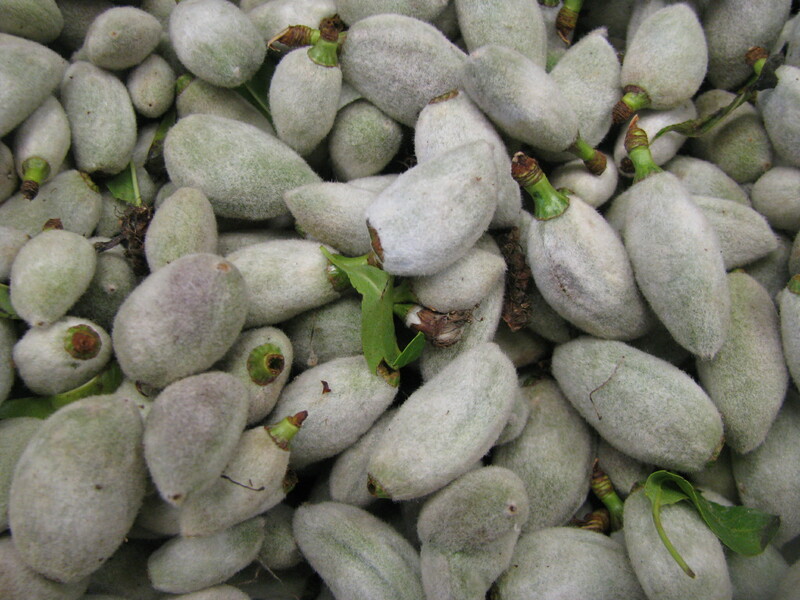 As well as buying our pies we also explored the stores and found these interesting green almonds, a Middle Eastern spring time snack.